Don’t go in the “kitchen.” Follow the double-bounce rule. Keep the wrists loose and vary your spin. Oh, and watch out for a certain 85-year-old player named Libby. If all this sounds a little off the wall, well, it is. What else do you expect from a sport called pickleball? But the silly-named game — a mashup of badminton, tennis, paddle ball and Ping-Pong — is becoming a serious hit around the country, and now in Vermont. According to the USA Pickleball Association (USAPA), the number of places to play pickleball nationwide has grown in the past 12 years from just 37 to nearly 1400, with more than 100,000 Americans now getting their pickle on. One is Louise Rashleigh, a 69-year-old Colchester resident and avid pickleball player. 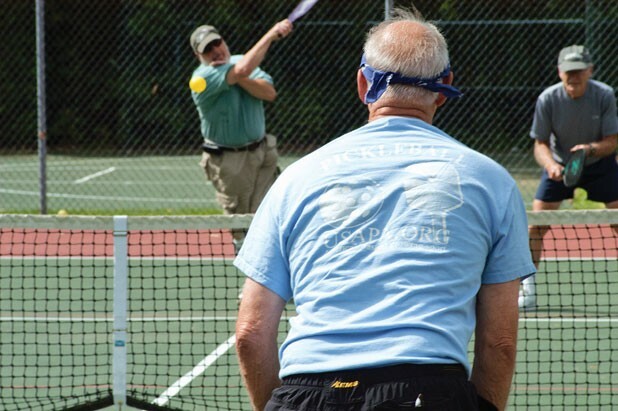 The sport arrived in the Burlington area, she says, “probably two years ago, with maybe two people.” Today, Rashleigh reports, Chittenden County has more than 100 regular pickleball players. And many of them are about to strut their stuff next weekend at the Vermont Senior Games 2012 Pickleball State Championships. On a recent Thursday morning at Essex’s Cascade Park, Lambert is sidelined from the action on the courts — he suffered cardiac arrest while playing tennis in March — and offers commentary. Games last about 10 to 20 minutes each, with players rotating in a round-robin style; when she’s not playing, Rashleigh chimes in every once in a while. “Bruce has the same spin all the time,” says Lambert, nodding his head toward Bruce Sarrazin, 69, an Essex resident who’s been playing for about 18 months now. It’s played on a badminton-size court, with perforated plastic balls (like Wiffle balls): Athletes stand on either side of a net lowered to 34 inches at the center, batting the ball back and forth until one side reaches 11 points. They can play singles or doubles, and players can enter the seven-foot nonvolley zone on either side of the net, called the “kitchen,” only when the ball bounces there. Think mini-tennis. Sort of. Pickleball was invented by a couple of Washington State dads hoping to amuse their kids one summer in the mid-1960s. According to the USAPA website, they named it for a cocker spaniel named Pickles who would chase the ball. Other sources maintain that the name came from “pickle boat,” a term in sport rowing. Either way, the name stuck. The sport was played mostly in disparate backyards until the founding of USAPA in the mid-1980s gave it momentum. Throw in the trend of aging baby boomers — who find the sport less jarring and more strategic than tennis — and the internet to help spread the word, and, by 2012, pickleball was a smash. A longtime tennis player, Lambert picked up pickleball just 11 months before he won the 2011 state championship with doubles partner Brent Shedd. As Rashleigh steps into another game, John “JB” Brassard jogs off one of the courts — which, in Vermont, are grids of red lines painted on tennis courts. It’s different in retirement communities such as the Villages in Florida, where Brassard, 64, learned to play and where hundreds of dedicated pickleball courts see constant action. Just watch out for Lambert, who won’t be at the Senior Games tourney but will most likely be back with a vengeance eventually. “You can hit the ball hard enough to knock somebody over,” he says of pickleball. “That’s only if they’re off balance to begin with,” Rashleigh protests. But these competitors seem to have their feet under them. Sarrazin says he just picked up some tips playing pickleball in Tennessee. Mike Sutliff, who quit playing basketball 10 years ago, says he’s fallen for pickleball’s fast pace. The Vermont Summer 2012 State Championship pickleball tournament, open to players 50 and older, will be held from June 22 to 24 in Shelburne. For more info, contact Dot Slack at 658-8039 or dotslack@aol.com. For the full Vermont Senior Games schedule, visit vermontseniorgames.org.